Three presentations at the BAAP meeting concerned current developments relating to r in Scottish English. • Gerald Docherty et al reported that findings emerging from a project on Accent and Identity on the Scottish/English border show that it is an oversimplification to say, as we usually do, that the English side of the border is non-rhotic while the Scottish side is rhotic. This project involved research into speakers from Gretna (purple marker on the map) and Eyemouth (blue) on the Scottish side and Carlisle (green) and Berwick (red) on the English side. Younger working-class speakers on the Scottish side, more in the west than in the east, are starting to lose their rhoticity. This confirms what has been reported elsewhere for Glasgow English. • Arising from the same project, Dom Watt et al showed that, compared with Eyemouth, Gretna is further along the historical path whereby the ɪr, ɛr, ʌr of bird, berth, hurt merge into a single ɝ ~ ɜ. “The loss of rhoticity appears to act as a trigger for the NURSE merger. It is not a necessary precondition, however, as the merger may precede derhotacisation.” The change is also probably triggered by a change from tap ɾ to approximant ɹ as the preferred realization of postvocalic /r/. • Eleanor Lawson et al used audio-ultrasound tongue imaging to show that two distinct ways of articulating the approximant have different effects on the preceding vowel. In central eastern Scotland, they found, working-class speakers tend to use a tongue-tip variety, which leads to retraction of the vowel, whereas middle-class speakers go for the “bunched” tongue configuration, leading to vowel centralization and completion of the NURSE merger. Another paper relating to Scotland concerned not English but Gaelic. It was a surprise to me to hear that over half the speakers of Gaelic are to be found not in the outer Hebrides but in the Glasgow conurbation. 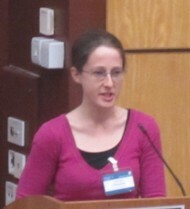 Claire Nance carried out research at a Gaelic-medium school there, the Glasgow Gaelic School/Sgoil Ghàidhlig Ghlaschu. Gaelic uː has two allophones: it is thoroughly back before lˠ nˠ rˠ but central ʉː in all other environments. Looking just at the Glasgow children’s pronunciation of the central allophone, Claire found it to be undergoing further fronting, just like the corresponding Glasgow English GOOSE vowel. Taking two groups of students divided by their degree of engagement with Gaelic and with schooling generally, she found that the studious, obedient ones keep their Gaelic vowels more distinct from their English vowels than do the ‘less school-oriented’ ones with attitude. But they all sound Glaswegian to other Gaelic speakers. Watch and listen to her yourself here. Bank holidays coming up. Next posting: 10 April. Certainly Americans are NURSE-merged but not (with historical exceptions) derhotacized, so that was not the original path. All interesting, but the double articulation of the approximant (and its effect) get the prize. The Scottish places pinpointed on the map are both places where the nearest major town/city is in England and there's quite a way to travel to anywhere of appreciable size on the Scottish side. I wonder what they would find for speakers just north of Cheviots, where this is not the case. "Younger working-class speakers on the Scottish side, more in the west than in the east, are starting to lose their rhoticity. This confirms what has been reported elsewhere for Glasgow English." rather refutes my guess that it's just a case of small places in Scotland near to a large English town or city. See here: "Traditional Scottish (x) (hw) and postvocalic (r) are undergoing complex changes, probably loss..."
How sad. I love an old-fashioned Scottish accent. BBC rugby commentator Bill McLaren was the possessor of one of my favorite voices in any accent of English -- you can hear him here if you're interested. Interestingly, it appears that he toned down his rhoticity for his commentary, by comparison with the informal style he displays in the interviews of this documentary.